Will Secret Wildlife Imports Doom Ultra-Rare Giant Sable? 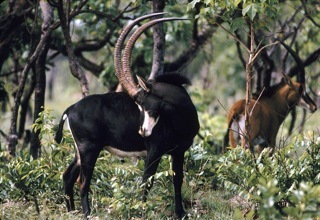 My report on the latest threat to the critically endangered giant sable antelope of Angola is now online at National Geographic News. Am reading your wonderful book, “A Certain Curve of Horn.” It is so beautifully written and because of that so difficult for me. The sadness is great. I am in the process of trying to write a poetry collection for children (ages 9 plus) on antelopes and am including the Giant Sable Antelope. I have had poems published in children’s magazines and am well-aware of the odds of succeeding. However, I hope teachers could use this and that children might develop a feeling for these incredible animals.